Tue., 12 Nov. - Fri., 6 Dec. Sun., 12 Jan. - Sun., 8 Mar. Sat., 9 Nov. - Tue., 3 Dec. Sat., 9 Nov. - Thu., 5 Dec. Tue., 12 Nov. - Mon., 9 Dec.
Wed., 13 Nov. - Thu., 5 Dec.
Fri., 8 Nov. - Sun., 8 Dec. Thu., 9 Jan. - Thu., 16 Jan. Sat., 23 Nov. - Thu., 28 Nov.
See all 365 properties in King Abdulaziz Intl. 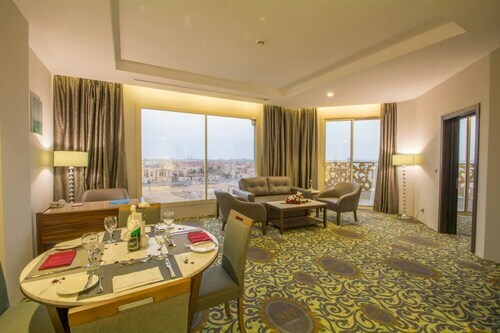 Situated in Jeddah, this hotel is within 6 mi (10 km) of Mall of Arabia, Heraa International Mall, and Jeddah International Exhibition Center. Sultan Mall and Floating Mosque are also within 9 mi (15 km). 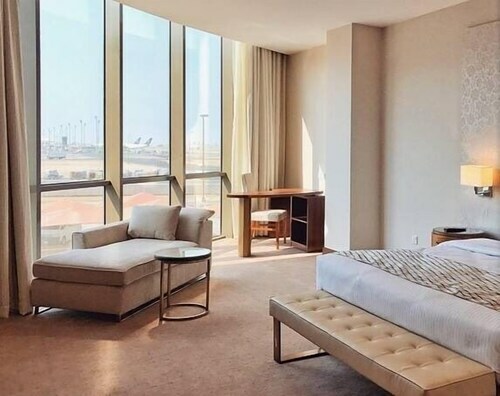 Situated in Jeddah, this hotel is within 6 mi (10 km) of Mall of Arabia, Jeddah International Exhibition Center, and Heraa International Mall. Red Sea Mall and Sultan Mall are also within 9 mi (15 km). Situated in Jeddah, this hotel is 3 mi (4.9 km) from Floating Mosque and within 6 mi (10 km) of Red Sea Mall and Mall of Arabia. Jeddah International Exhibition Center and Heraa International Mall are also within 9 mi (15 km). 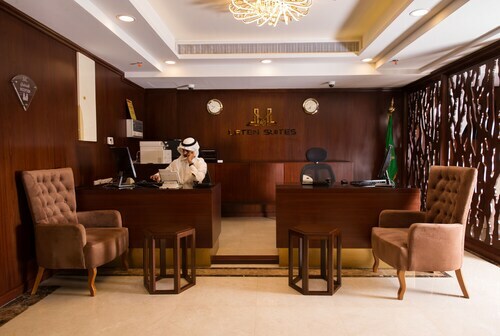 Situated in Jeddah, this hotel is within 6 mi (10 km) of Mall of Arabia, Heraa International Mall, and Jeddah International Exhibition Center. Red Sea Mall and Sultan Mall are also within 12 mi (20 km). 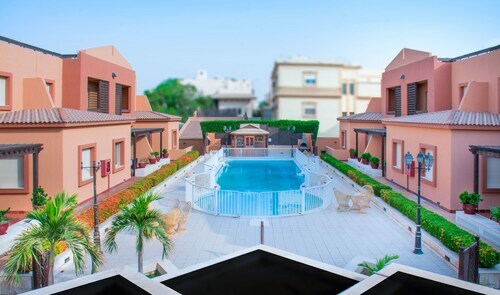 Located in Jeddah, this family-friendly villa is 2.7 mi (4.3 km) from Floating Mosque, and within 6 mi (10 km) of Red Sea Mall and Mall of Arabia. Heraa International Mall and Sultan Mall are also within 6 mi (10 km). 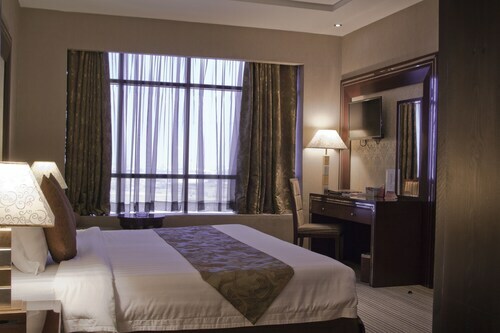 Situated in Jeddah, this hotel is close to Floating Mosque and Red Sea Mall. Area attractions also include Mall of Arabia and Jeddah International Exhibition Center. Situated in Jeddah, this property is 2.5 mi (4.1 km) from Floating Mosque and within 6 mi (10 km) of Red Sea Mall and Mall of Arabia. Heraa International Mall and Jeddah International Exhibition Center are also within 6 mi (10 km). Situated in Jeddah, this apartment building is 2.8 mi (4.5 km) from Floating Mosque and within 6 mi (10 km) of Red Sea Mall and Mall of Arabia. Sultan Mall and Heraa International Mall are also within 6 mi (10 km). Answer : You sure can switch your departure or arrival date and you may save money by doing it. The cheapest day to fly in May is Friday. Question : What airports do you fly into for Jeddah? Answer : Pearson International Airport is a wonderful airport, but there is a lower cost option in getting you to Jeddah— Billy Bishop Toronto City Airport. It's just 11 miles away from YYZ and flights are booked 59% cheaper over the next few months. Question : How much time do people spend in Jeddah? Answer : The average time spent sightseeing in Jeddah by travellers from Toronto is 35 days. Question : How long does it take to fly from Toronto to Jeddah? Answer : Saudia currently holds the fastest travel time with 11 hours and 45 minutes. So, you would arrive in Jeddah at 8:30 AM +03 if you left Toronto at 12:45 PM EDT. Don't forget, there is a time change of eight hours. Question : How long is the flight from YYZ to JED? Answer : Saudia can get you there in 11 hours and 45 minutes. So, if you were to leave Toronto at 12:45 PM EDT, you would get to Jeddah at 8:30 AM +03. Giving you enough time to catch up on your reading before you touch down (don't forget, there is an eight hours time change). Question : What is the cheapest date to fly to Jeddah? Answer : As of Apr 22nd, the best day for booking to Jeddah (JED) is May 21st. A ticket for this flight will run you around $1,110, which is 49% below the average price to book the same route. Question : What is the cheapest airline flying from Toronto to Jeddah? Answer : British Airways is offering the best deal at $1,110. Better look fast because prices range all the way up to $12,909 over the next three months.